Best Buy first tweeted the news. Sometimes you can believe what you read on Twitter. Best Buy has confirmed that it is indeed selling iPhones for free on Friday, for one day only. The bad part is the electronics store is only giving away the iPhone 3GS but the good news is there is an instant rebate, so there are no annoying forms to mail in and wait for a check to come in the mail. 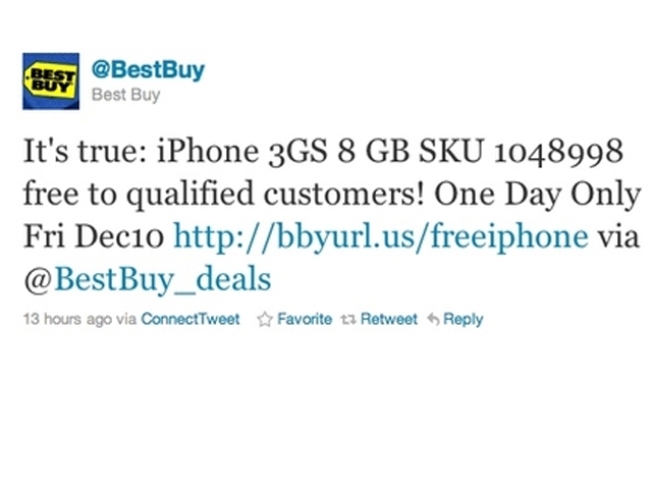 Best Buy first tweeted the news about the free iPhones but many questioned whether it was real or not. But the company confirmed it with a post on its website as well. But like all good deals, there is a catch. The offer is available to qualified customers only, which means you have to be a new AT&T customer or eligible for an upgrade. That also means you have to be willing to lock yourself into a two-year contract on the nation's worst service carrier, if you believe reports anyway.